Chuck Cook was born on 28 July 1926 in Regina, Saskatchewan, Canada. He died on 23 February 1993. He was a CJOR radio talk show host in Vancouver, British Columbia in the 1970s. He served as Progressive Conservative Member of Parliament from 1979 to 1993 in the North Vancouver riding of Burnaby. He also ran for the Progressive Conservative Party of Alberta in the riding of Calgary Centre in the 1967 Election but came up a very close second to Fred Colborne of the Alberta Social Credit Party. CHUCK COOK: The voice of reason is a 50-year-old non-practising lawyer who started with talk radio in Calgary in the mid-60s. Cook is technically a part-time host, although his 20 weeks of replacements and 46 weekends a year give him as much work as Ed Murphy and that all-important profile advantage. Cook exerts a cooling-out influence. The excitement of openline radio, however easily fades in the sweetness and light. He is less inclined than the others to parrot the democratic virtues of the biz. For example, he says, the openlines reflected nill Liberal support in the last federal election. "There is a big difference between the public and the audience." (On the other hand, Webster believes Dave Barrett holds him responsible for the 1975 NDP defeat. However, much that belief relates to the Webster ego, the talk shows were as accurate a poll as any in that election.) "People tend to listen only to opinions they agree with." He doesn't agree with the term "babysitting", but "You could call it a conversation service. Some people calling in, I may be the one person they talk to that day." More than 300 people crowded into St. Catherine's Anglican Church in North Vancouver yesterday for a simple half-hour service to say goodbye to Chuck Cook. The 66-year-old Conservative MP died Tuesday of cancer. "He had a wonderful sense of humor," said Rev. William Pike. "He was a person who stood for honesty and integrity." Cook's son Ken said his father seemed to want to confound the doctors as much as he did his fellow politicians by smoking more than 60 cigarettes a day. "And there were few things in life he enjoyed more than a good game of poker or chess," said Ken. Kim Campbell, Mary Collins, John Fraser, Grace McCarthy, Tom Siddon and Brian Smith were among the mourners. Cook was elected to the House of Commons in 1979, 1980, 1984 and 1988. He announced last year he would not be running again. Known as a maverick, Cook outraged nationalists by saying that only five per cent of Canadians read Canadian books, so Ottawa should cut publishers' subsidies. Yet Pike said the "extremely well-read" Cook "could carry on an informed conversation on almost any topic." The Regina-born MP was also well-educated, with a law degree and a master's degree in business administration. Cook was the only Tory to speak out against the Charlottetown accord. The family will place a bench in his memory in Deep Cove's Panorama Park, where he loved to walk. 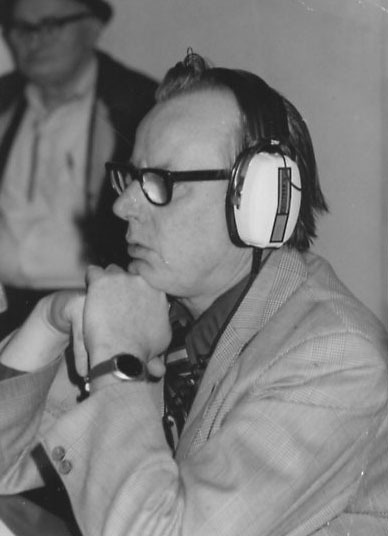 Born in Regina in 1928, Cook worked as a radio disc jockey in Winnipeg before becoming a lawyer and later working as an open-line radio host in Vancouver. Cook first came to the Commons in 1979 and was re-elected in 1980, 1984 and 1988. He was chief Opposition whip in 1983 and became government whip in 1984. Cook was born in Regina and received his education at Burbank Military Academy, Northwestern University in Chicago, the University of Western Ontario and the University of Saskatchewan. He earned a law degree and a master's degree in business administration. Cook, who died in hospital on Tuesday night, is survived by his wife, Dale, two sons and one daughter. I worked for five years at CJOR when it was a halfway house for politicians on the way up or on the way down. Jim Nielsen and Chuck Cook worked 'OR open-line mikes before entering politics. John Reynolds, Dave Barrett and Rafe Mair, having learned - if nothing else - how to speak nonstop from an elected seat, brought that gassy asset to radio when their political time ran out. Cook was the swing man at 'OR. He worked the Saturday and Sunday shifts, but he was on call, at short notice, when one of the other regulars was hoarse or drunk or vacationing. It was his great talent that he could not only replace a Webster, Burns or Nielsen, but he could almost imitate them - if not the tone of voice, the tone of the social and political attitudes of the missing regular. Magazine executive Neil Soper, who was CJOR program director during the Seventies, said this weekend, "Chuck was adaptable, a radio chameleon. He was a very good talk-show actor because he could be anyone, light, heavy, left, right. "His contract called for him to do so many hours a year. So he did his weekend show, but he could come in on an hour's notice to replace someone else. "Some people thought Chuck was a lawyer who wandered into radio. That's wrong. Before he got his law degree he was a very successful morning deejay in Winnipeg, pulling all the usual morning man's stunts. Can you imagine Chuck as a young Frosty Forst?" No, I couldn't. I remember Cook's wardrobe. It could make your eyes water. I remember his ashtray-thick glasses. On a sunny day you could ignite kindling with the lenses. I remember his loose, jangly walk and his cigarette holder and the way he loved an argument, on air or off. I think it was debate, more than anything else, that delighted Cook. Law, talk radio and politics are all a matter of debate and he was lucid and excellent on all three platforms. Curiously, and perhaps unfairly, all the stories that followed his death last week at 66 said he was a "maverick MP', the "renegade Tory", as if there was something lacking in him. That's wrong and dead wrong now. Cook simply never bought into that self-serving notion of cabinet and party solidarity. The cabinet hadn't elected him, the voters in North Vancouver did and they were the people he felt responsible to. He was, rather than some political freak, the politician we should all demand, the loyalist to his constituents, not to his caucus. So he broke ranks and voted against the Charlottetown accord because, he said, "I'm looking at it from a B.C. point of view and from a B.C. point of view, this deal stinks." If Cook was a heretic in federal politics it was only because he didn't change when he got on that big stage in Ottawa. He danced for the ones what sent him.